Islamic history suffers from no dearth of luminaries, be they mystics, philosophers, theologians, physicians or grammarians. A star among these is Jafar al-Sadiq (born 702, died 765, Medina) who was the fifth generation grandson of the Prophet of Islam. Jafar al-Sadiq is a meeting point for diverse Muslims. Through his parentage Jafar brought together in his person, the Prophet's familial line and that of the paramount Sunni Companion, Abu Bakr, from whom his mother, Umm Farwah bin Qasim was descended. Within the Shi'a world, he is the last imam common to both the Twelvers, and the Seveners. Among the Sufis he is venerated as a spiritual 'pole' (qutb) and is to be found in the lineage (silsilah) of most Sufi orders (turuq). The Sunnis have a deep reverence for him, holding him next only to his forefather Ali b. Abi Talib for his combination of holiness and knowledge. By all accounts, Jafar's profoundly God-aware ethics of truthfulness, justice, tolerance, and peaceability, were exemplary indeed. Reports reveal his ontological role towards God and creature: when he faced creation he was a divine ambassador, manifesting God's constant and patient availability, transmitting the divine qualities, guiding to that wise proximity to God that comes through living in a godly manner, in harmony with the divine; when he faced God, he was an intercessor for the creation. For his community directly, he was their imam, their religious and spiritual guide. Shia jurisprudence received its definitive form at the hands of Jafar al-Sadiq, who was responsible for codification of Shi'l religious law- called the Jafariyya madhhab. The majority of the Shi'a hadiths and traditions are reported on the authority of the Imam Jafar al-Sadiq and his father, Muhammad al-Baqir, Allah's peace be upon them both. He was a plenary teacher and had among his students more than one early 'father' of the Islamic sciences. For instance, eminent Sunni theologians and foundational traditionalists such as Abu Hanifah, Malik b. Anas and Sufyan al-Thawri studied with al-Sadiq. His study circles are said to have produced some four thousand scholars in hadith studies and other fields of learning. The alchemist Jabir b. Hayyan - one of the first people to be known as Sufi and to whom the esoteric science of jafr is also ascribed - was taught by Jafar al-Sadiq. Imam Sadiq himself was an astronomer, an alchemist, an Islamic scholar and theologian, a writer, a philosopher, a physician, and a physicist. In the Shi'i doctrine of the imam's knowledge, the imam is the 'speaking Quran (Quran natiq) while the Quran itself is the 'silent imam' (imam samit). That is, the imam is considered the true interpreter of the Book. A Sufi Collection of Jafar exegetical comments can be found in the compendium of Quranic commentary compiled by Muhammad al-Sulami (d. 1021). 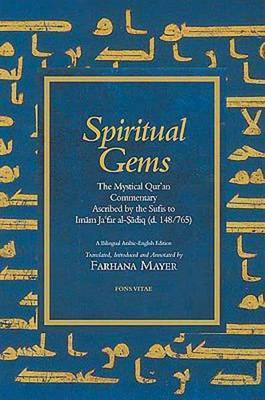 The Book Spiritual Gems is actually based on Sulami's Haqaiq al-Tafsir, from the text of Paul Nwyia. The Sufi recension of Jafar al-Sadiq's exegesis of the Quran profounds a spiritual and mystical interpretation - the commentary is fully permeated with the profoundest wisdom. Certain comments are particularly saturated, containing a depth of, and intimacy with, spiritual and mystical experience (dhawq) that is breathtaking; indeed it is transporting. The wisdom is revelatory with the pure scent of authentic ilm laduni. In the exegesis, we find central tenets of spiritual and mystical doctrines such as the sole reality of God; His absolute and total oneness and uniqueness (ahadiyah, wahidiyah); the vision of God (ru'yat Allah); the assembly of the witnessing (mashad al-mushahadah); effacement and continuity (fana and baqa); the remembrance and invocation of God (dhikr Allah); the divine secret (sirr) embedded in humankind; mankind's absolute neediness unto God (iftiqar); and the love and knowledge of God (mahabbat Allah, marifat Allah). The source of this translation, the Haqaiq al-tafsir is a compendium of early Sufi Comments on the Qur'an(thought to have been completed by 980) and contains a collection of interpretative comments on Quranic phrases by a number of early Muslim mystics such as Abu Yazid al-Bistami, Sahl al-Tustari and Abu Bakr al-Wasiti among other. It is also the source for the Sufi recension of Jafar al-Sadiq's Quran commentary, which contains 309 comments by the imam, making him one of the most frequently quoted authorities in the compendium. Unlike later Quran commentaries that systematically address the whole of the book, in the tafsir by Jafar only select Quranic verses, words or phrases are discussed. This selectivity is typical of mystical commentaries universally and reflects the multifaceted nature of heavenly communication. In the opening citation of the tafsir, the following is related from Jafar al-Sadiq: 'The Book of God has four things: literal expression (ibarah), allusion (isharah), subtleties (lataif), and the deepest realities (haqaiq). The literal expression is for the commonality (awamm), the allusion is for the special (khawass), the subtleties are for the friends (of God, awliya), and the deepest realities are for the prophets (anbiya). Allusion, subtlety and reality define the different levels of interpretive comments contained in the tafsir Jafar, and place the reading of this commentary on the spiritual register. has there come upon man any time (in which) he was not a thing remembered? Has there ever come upon you, O Man (ever) an instant in which God did not remember you? and their Lord gives them a purifying drink to drink. He, the Glorious Lord, gives them the divine unity to drink in the inmost self, and they are totally lost to all other than Him. They do not regain their senses except at the eye-to-eye seeing and the veil on that which is between them and Him is raised. The drink is taken in what is taken from him (ie from the drinker); and no remnant of him remains in him (ie in what is taken from him). And He draws him forth into the arena of blissful joy and divine Presence, and the divine clasp (of God's embrace). About His words, a purifying drink: He purifies them, through the drink, of everything other than Him, since he is not pure who is contaminated by anything pertaining to beings. Imam Jafar said: Those who listen with the hearing of the heart and who see with the eyes of the unseen (ie. with spiritual vision). you shall not attain (to true) beneficence until you spend of that which you love. Imam Jafar said: Through expending his life the slave (of God) arrives at his Beloved's beneficence and his Lord's proximity. Jafar (also) said: They shall not attain unto the Truth until they detach themselves from what is other than Him. and whoever holds fast to God has indeed been guided to a harmonious way. Concerning this verse, Jafar said: Whoever knows Him is, through Him, independent of all mankind. Imam Jafar said: God-awareness is that you see nothing in your heart other than Him. rather God is your protecting patron. Jafar said: (He is) in charge of all your affairs, from the beginning to the end. restrain yourselves and persever stoutly and station yourselves; and be aware of God that you may succeed. Imam Jafar said: Restrain yourselves from disobedience (to God), persevere in acts of obedience (to Him), and station (your) soul in the witnessing; and be aware of God, that is, avoid being presumptuous with the truth, that you may succeed, that you attain the way station of the people of sincerity, for that is the locus of success. the kindled fire of God. Which rises up, overwhelming hearts. Concerning the above words: The fires are diverse, varied. Among them is the fire of love and gnosis burning in the hearts of the monotheists; while the fire of hell burn in the hearts of the disbelievers. When the fire of love ignite in the heart of the believer, they burn up every eagerness for (what is) other than God, and every remembrance other than His remembrance. Translators Note: The blissful obliteration that is the impact of the blazing presence of the divine qualities. The fires of love/care are to be understood as light, in keeping with the comment at 28:29, where it is said of Moses that he saw a fire, when the conquering King comes in, the own is destroyed of its native (read fallen) nature; and as the unveiled vision of God would consume Moses, even so the fires of divine love burn all other than the divine Subject/ Object/ Content Love. Imam Jafar al-Sadiq said about His words Yaa Siin: They mean, Ya Sayyid; O lord (and are) addressed to His Prophet, may God's peace and blessings be upon him. That is why the Prophet said, "Ana sayyidukum: I am your lord.' In that he was not praising himself, rather he was relating the meaning of the Truth's addressing him with His words Yaa Siin. no fear is on you this day nor do you grieve. No fear is upon those obeyed Me (the Divine Lord) in (My) commands and religious obligations and who followed the custom established by the Messenger. In the hereafter, no fear is upon the one who feared Me in the world. No fear is upon the one who loved Me and eliminated the love of others from his heart. No fear is upon the one who safe guarded what I placed with him, namely faith and spiritual knowledge. No fear is upon the one who brought good of Me - I shall give him that which he hoped for. Fear (befalls) the limbs while grief (befalls )the heart for fear of being cut off (from God). and therein is that which the souls desire and enraptures the eye. What a difference between what the souls desire and that which enraptures the eye. For all the blessings, desirable things and delights of paradise are, in comparison with the rapture of the eyes, as a finger dipped in the ocean - because the desirable things of paradise have a limit and an end, for they are created. But in the ever-abiding abode the eye is enraptured only in gazing upon the Ever-Abiding (Himself), Glorious is He! And that has no limit, nor description, nor end. This book is so far one of the best English translation of any Quranic trafsir. As mentioned earlier, this book has every verse interpreted, but only very selected. But what is remarkable is to the light which is shed and the very deep recesses of mysteries which is unveiled here. The book can be picked at any verses and you will be surprised to see inner beauty revealing from diverse gems. At reading some of the explanation your heart may want to stand up and dance. May Allah help us understand His Beauteous Beauty, His Infinite Mysteries and His never slacking Grace. May we be worthy of receiving what He wishes to Give to Us emptying Him of Himself in every instance. Allah! Allah! Allah! 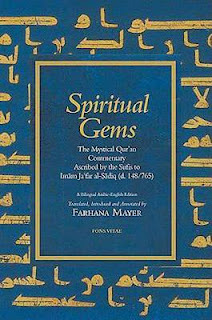 Spiritual Gems: The Mystical Qur'an Commentary Ascribed by the Sufis to Imam Ja'far al-Sadiq (d. 148/765) (The Fons Vitae Qur'anic Commentary Series) - some portion shared on Technology of the Heart.